MissHeard invites you to submit! February’s theme is Healthy Relationships. February is Teen Dating Violence Awareness Month. We know that not all of our readers are interested in dating, so the topic is expanded to include ALL types of relationships, including friendships, siblings, parents, etc. Want to talk about relationships, but not sure where to start? Something else entirely! The sky’s the limit- we love to hear and share all kinds of ideas. The last week of February is also National Eating Disorder Awareness Week. We invite you to submit something on NEDA Week as well. Relationships include your relationship with yourself and your body too! We invite you to share articles, interviews, listicles, personal essays, art, poetry, photography, playlists, music- whatever format helps you share your thoughts. 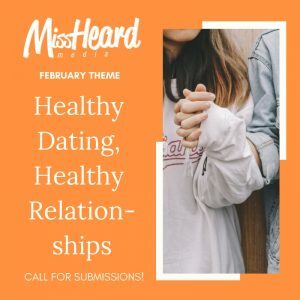 Please send your submission, along with a short, 1-2 sentence bio, and a photo (optional) to hello at missheardmedia dot com!